Get it right and panna cotta might be one of the dreamiest desserts on the planet; get it wrong, and it could double as a weapon. My first attempt at panna cotta was a disaster; hard and rubbery, slightly grainy, and not particularly palatable. In truth, if I’d thrown one at a wall, it would have bounced right back at me. With no alternative, I served it up apologetically to dinner guests and the meal ended on a lacklustre note – always disappointing because dessert is the lingering memory that one takes home, the fodder for sweet dreams. Or not. “How far ahead did you make them?” my mother queried when I relayed the dismal result over the phone. When I told her that I’d made them the day before, she emitted a knowing, “Hmm”, and advised making them four to six hours ahead for jiggly perfection. “And go easy on the gelatine,” she added. “What about the graininess?” I asked. “Try gelatine sheets rather than powder, darling,” she suggested, believing that the sheets generally dissolve more easily, yielding smoother, silkier results. Taking this advice on board, the next renditions were a delicious, quivering delight but it was nerve-wracking making them at the 11thhour (around four hours before). While they held their ground, they appeared to be on the verge of collapse when unmoulded, and who needs that kind of added pressure at a dinner party? I’ve since made suitably wobbly renditions anything from six to 18 hours ahead (late the night before a lunch or on the day of a dinner), sticking to those sheets where possible, which definitely produce better results. They aren’t, however, always available at supermarkets (you’ll generally find them at specialist baking shops) so when needs must, I’ve picked up a couple of tips via Google to avoid my initial heavy, grainy results with powder. For example, to ensure that all granules dissolve, chef David Lebovitz recommends (on his blog Living the Sweet Life in Paris) sprinkling them “over the surface of cold water […]. Do not dump them in a pile, as the granules in the middle won’t dissolve.” He explains that it’s important to use cold water at this stage because hot water will cause the gelatine granules to “swell on the outside too quickly, preventing the water from getting in to the center”. Another handy tip comes from Russ Parsons in a piece on panna cotta for the Seattle Times, who says that to ensure the granules are fully integrated, you should “rub a little bit of the cream mixture between your fingers — there shouldn’t be any grit from undissolved sugar or gelatine”. Believing that a “good panna cotta is as good as dessert gets” (and I’m inclined to agree), Parsons set out to perfect the dish, testing various combinations of ingredients, ratios and techniques, going so far as to compare results on a spreadsheet, so definitely worth a read if you’re a pushover for precision. Finally, moving from texture to taste, while a traditional vanilla-flavoured panna cotta is perfect, I love the addition of cardamom to the mix for a slightly more complex flavour. 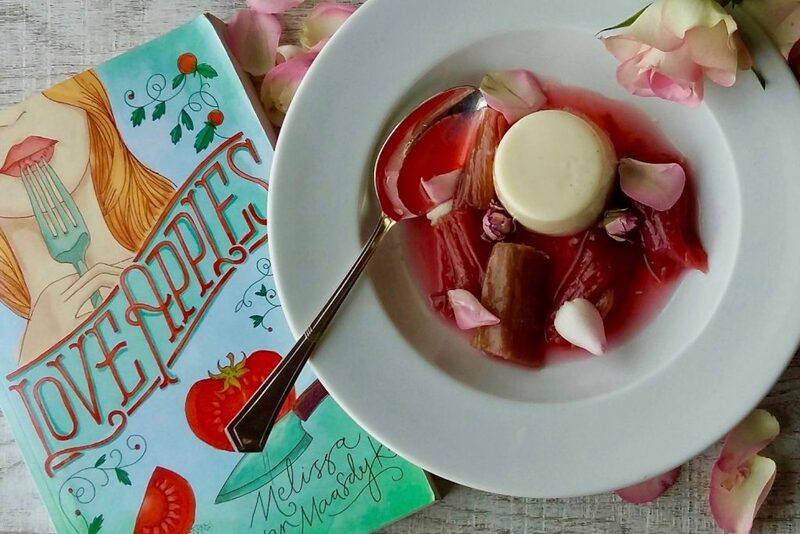 This also marries well with the rose essence in the rhubarb compote here, as noted by Love Apples’ protagonist Kate when her mother serves it up at the end of an indulgent Sunday lunch. Pretty in pink, rhubarb’s a delicious, slightly tart complement to the rich creamy star of the show. 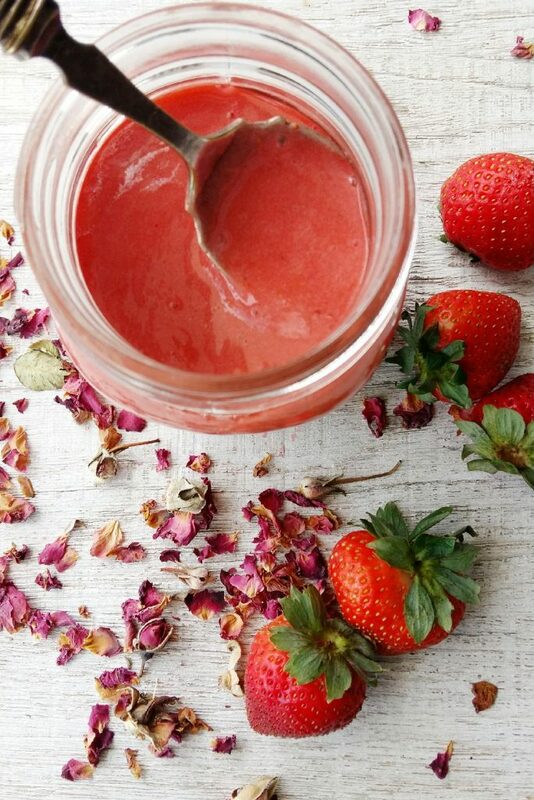 If out of season, however (and even the most worldly of supermarkets battle to stock rhubarb all year round), go for a strawberry coulis (recipe included below) or your choice of seasonal fruits – poached or in the raw. Sweet dreams! ** See cook’s note below for instructions on how to use powdered gelatine. Grease 6 (125-millilitre) metal dariole moulds with oil, and set aside. Put the double cream and single cream or milk in a medium-sized pot. Split the vanilla pod lengthways, scrape the seeds into the pan, and then add the pod, along with the cardamom pods. Add the sugar. Heat until simmering. Remove from stovetop and infuse for 30 minutes. Meanwhile, soak the gelatine in a bowl of cold water for 5 minutes. Squeeze out excess liquid with your hands. Strain the cream mixture to remove vanilla and cardamom pods, and reheat. Remove from heat just before boiling. Add the gelatine to the cream mixture in the pot, stirring until dissolved. Allow to cool then divide the mixture between the six greased moulds (not all the way to the top). Once cool, cover with cling film, and place in fridge to chill and set for a minimum of four hours (6 plus works for me). Just before serving, dip the moulds into hot water for a couple of seconds and then turn the panna cottas onto plates (if they don’t come out immediately, tap the mould with a spoon, hold the plate and mould tightly together, and shake). Place a large spoonful of rhubarb compote on each plate, and garnish with a sprinkling of rose petals or a sprig of mint. If sheet gelatine is unavailable, substitute with gelatine powder as follows. Sprinkle 4 teaspoons of powder (or amount recommended on gelatine package to set 750 millilitres liquid) over 45 millilitres (3 tablespoons) of cold water in a medium-sized, heat-proof bowl. Leave to soften for 5 minutes then pour the reheated cream mixture over the gelatine and stir until completely dissolved. Proceed as above. Cut the rhubarb stalks into 4- to 5-centimetre pieces, and place them in a sauté pan or a medium-sized saucepan. Sprinkle over the sugar and then add rose water mixed with water. Stir to combine. Cover and simmer over a medium-low heat for around 7 minutes. Shake the pan from time to time to prevent sticking, but resist the temptation to stir since this will cause the rhubarb to break up (it becomes soft very quickly). Taste, and cook for a couple more minutes if not yet tender. Remove from the heat and allow to cool before serving with panna cotta or ice cream. Place strawberries in a saucepan, together with the water, caster sugar, lemon juice and 1 teaspoon of rose water if using. Bring to a boil and allow to bubble on high for 1 minute then reduce heat to medium-low and simmer uncovered for 10 minutes (don’t overdo the time as strawberries lose their colour if overboiled). Set aside to cool and then liquidize. 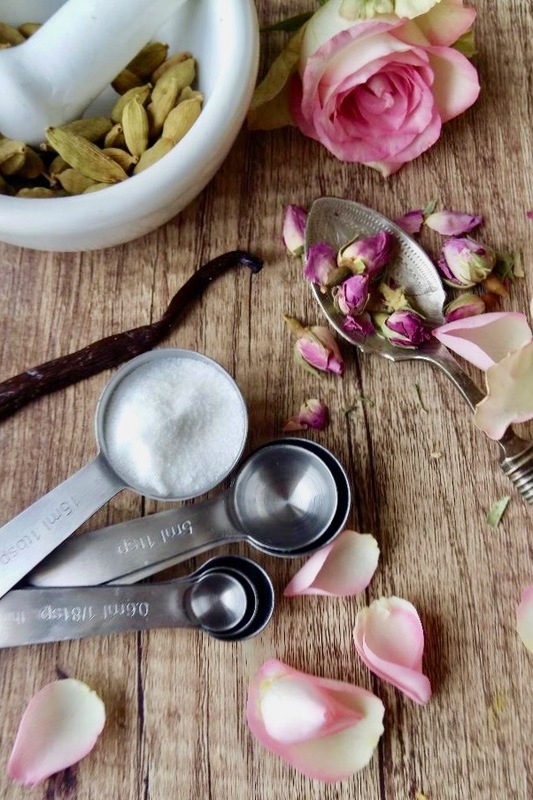 Taste and add up to another teaspoon of rose water if you’d like a more floral flavour. Chill in the fridge until required. Spoon onto plates in a swirl beside the panna cotta and finish off with a sprinkling of fresh berries (strawberries, raspberries…) plus a couple of sprigs of mint and/or rose petals.